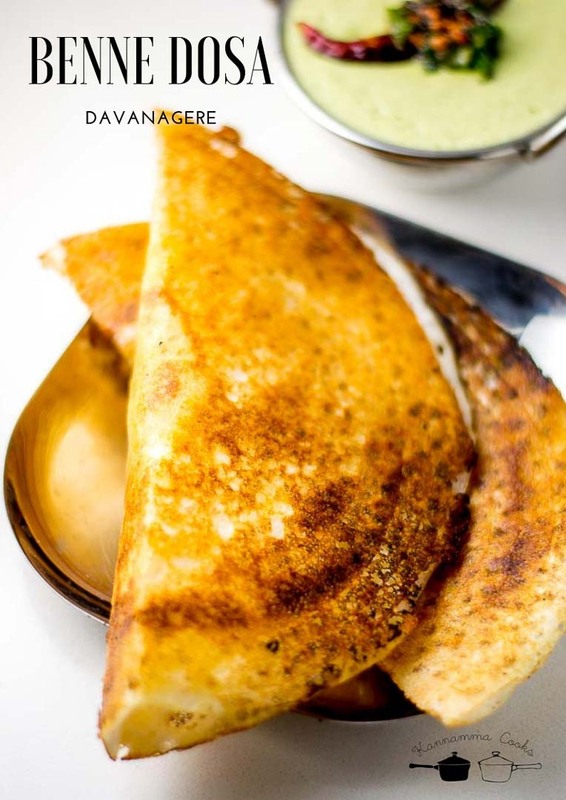 Recipe for Davanagere style benne dosa / butter dosa. Dosa made with butter. Recipe with step by step pictures. 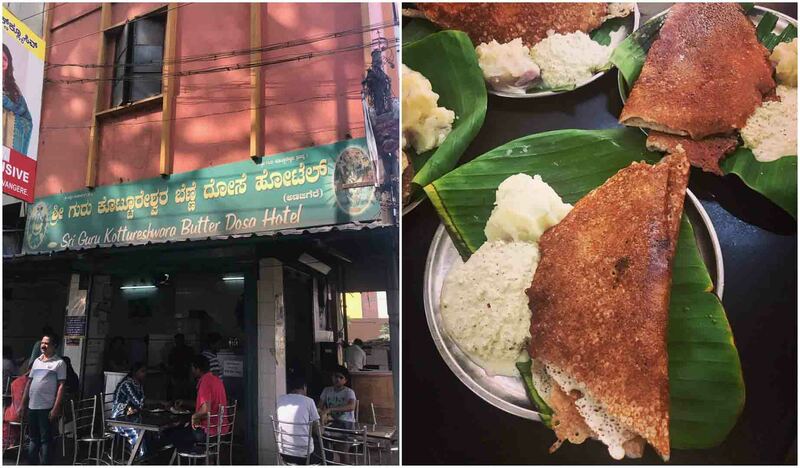 I am a fan of Davanagere style Benne dosa and recently we tried these at Davanagere at the popular Sri Guru Koteswara hotel. The texture of the dosa is something so different. Its crisp on one side and so spongy on the other. 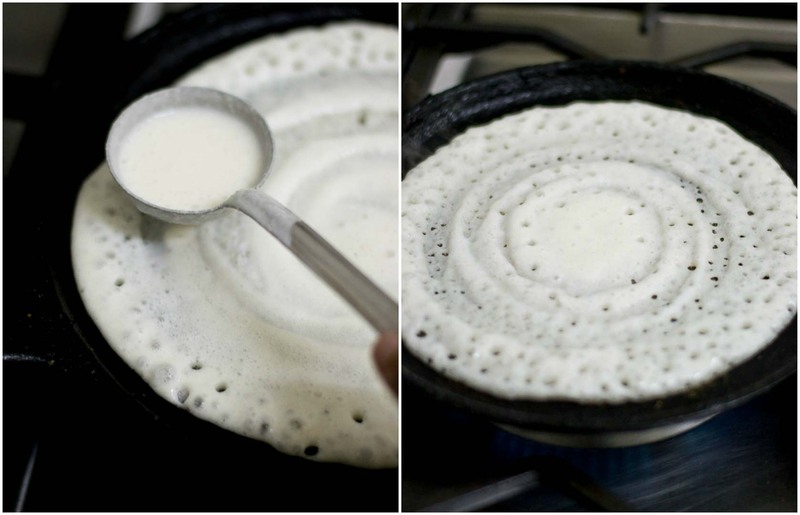 On enquiring, the dosa master told that the uniqueness of the dosa batter is in the addition of murmura / mandakki / pori (puffed rice). Also parboiled rice is used. I tried the recipe after coming home and after a few tweaks, here is my version of the benne dosa. 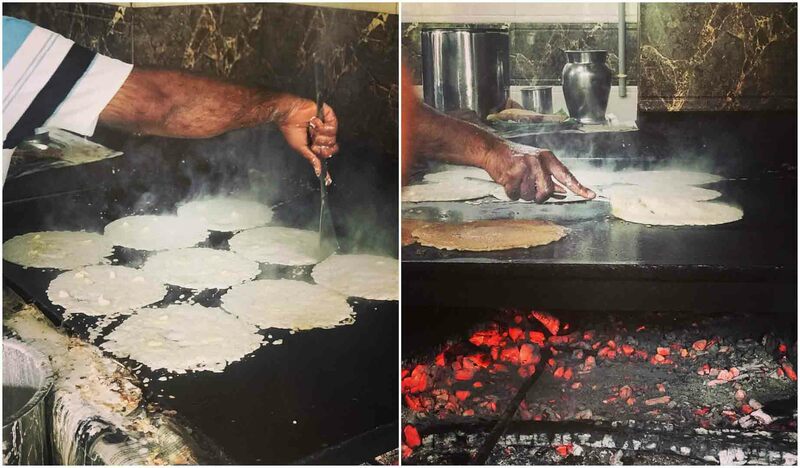 Traditionally, the dosas are cooked in an wood fired oven and it is hard to replicate at home. The dosas gain a slight woody / smoky flavour that’s so delicious. 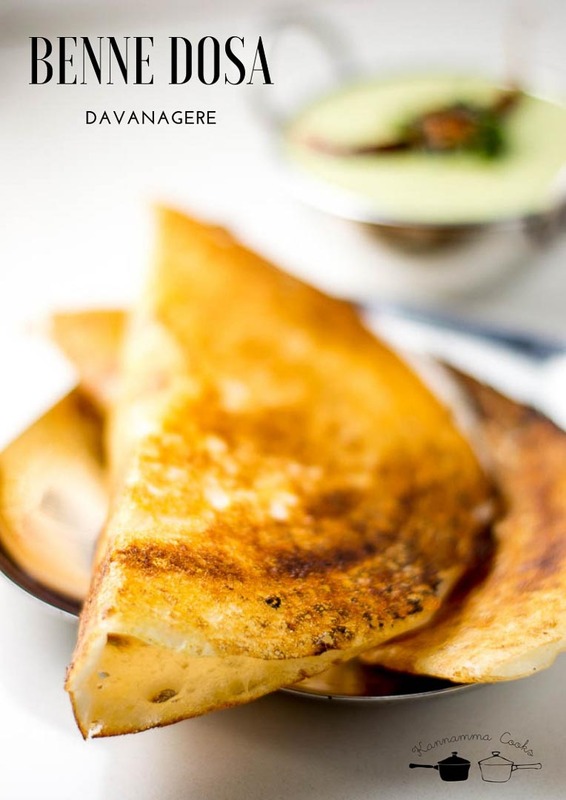 The dosas are usually served with coconut chutney and spiced potatoes. 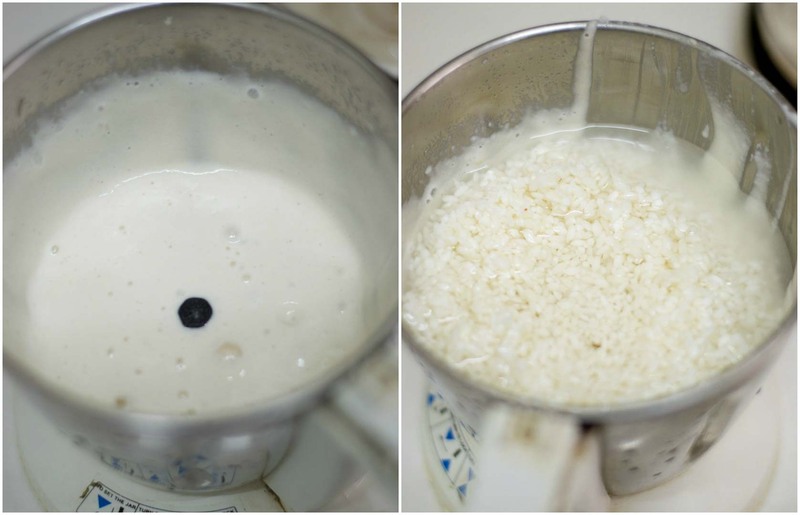 Soak the urad dal and idli rice for 4-5 hours or over-nite. 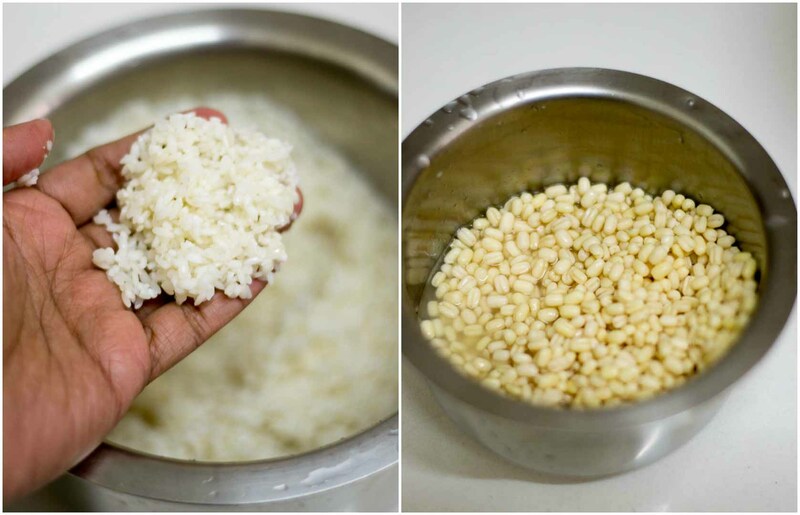 If you cannot get idli rice, the best substiture will be using par boiled rice. Grind the urad dal with half a cup of ice water. Ice water helps in keeping the mixie cool so the urad dal does not become hot while grinding. Set aside on a bowl. 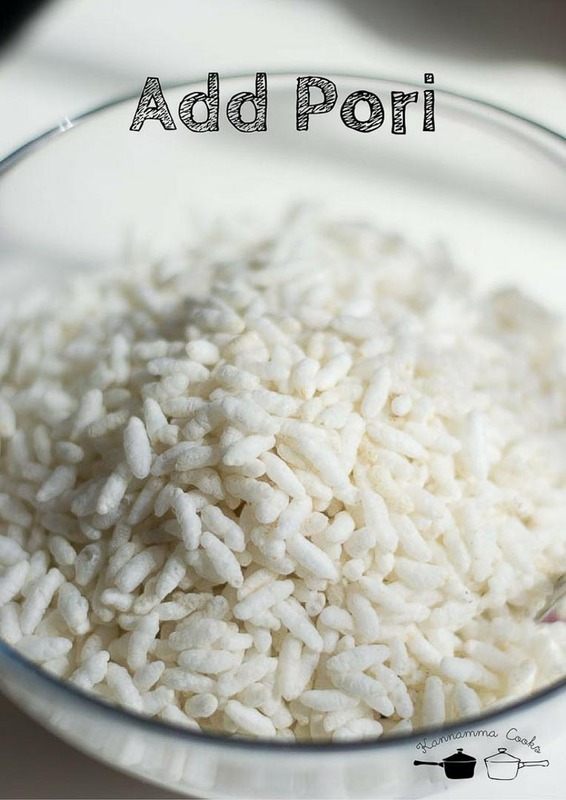 Grind the rice with a cup of water to a smooth paste. Make sure that the rice is ground fine. Add it to the same bowl. Now comes the secret ingredient, pori!!!! Also called as murmura or mandakki. Grind the pori with a cup of water and add it to the bowl. Ferment the batter for 6-8 hours. The batter should have doubled in volume. Dosa batter is ready. 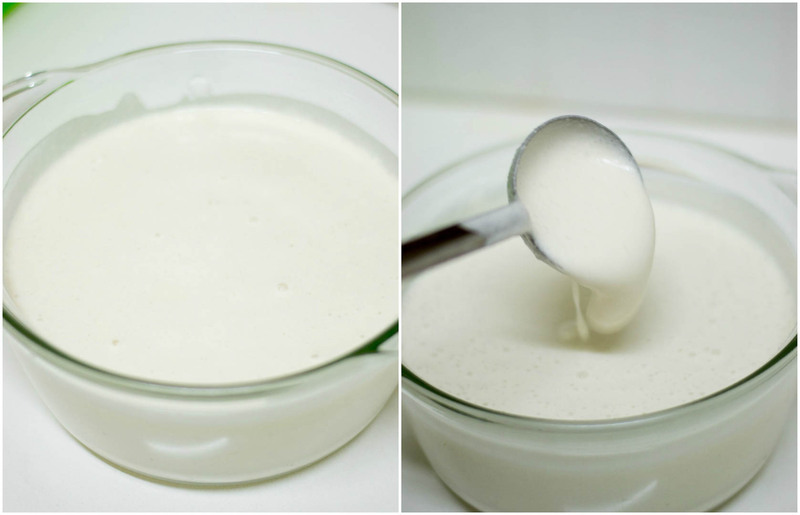 If the dosa batter is very thick, thin it out by adding very little water. I use a cast iron pan and this is a Lodge cast iron pan. Here is where you can buy the pan. Heat the dosa griddle until medium hot. Add 1/3 cup batter and swirl to cover dosa griddle. Let the dosa be a little thick. 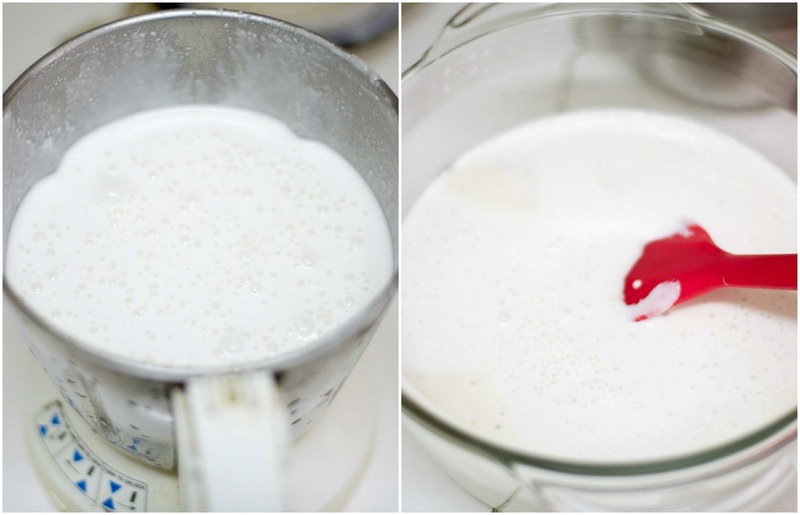 The batter will instantly bubble up. Sprinkle 1/2 teaspoon of melted butter or ghee to the dosa. Cook until underside of the dosa is golden brown, about a minute. Loosen the edges of the dosa with a steel spatula. flip the dosa. Cook for 30 seconds more. 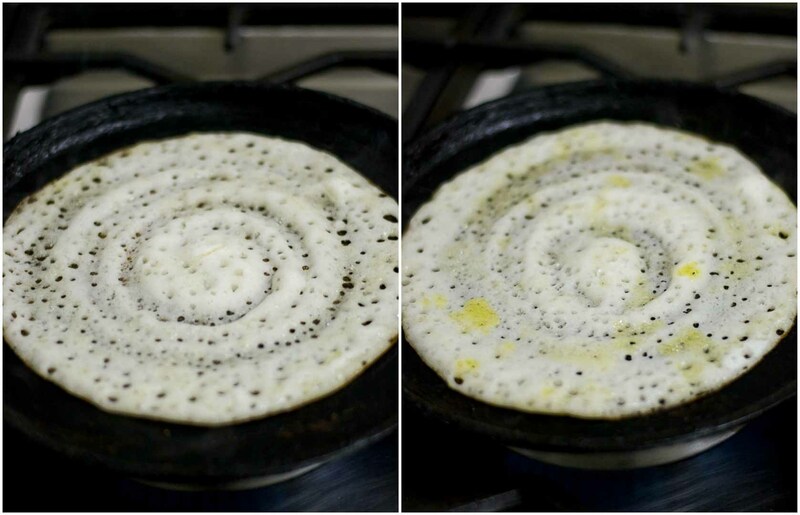 Remove dosa from the griddle and repeat with remaining batter. Serve hot with coconut chutney. The batter can be stored in the refrigerator and used for up to three days. Soak the urad dal and idli rice for 4-5 hours or over-nite. Grind the urad dal with half a cup of ice water. Set aside on a bowl. 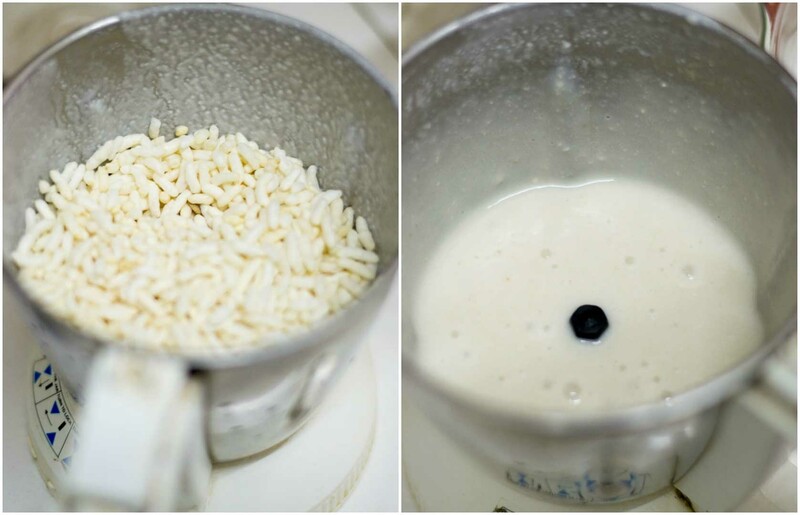 Grind the rice with a cup of water to a smooth paste. Add in the salt and mix everything well. Ferment the batter for 6-8 hours. The batter should have doubled in volume. Heat the dosa griddle until medium hot. 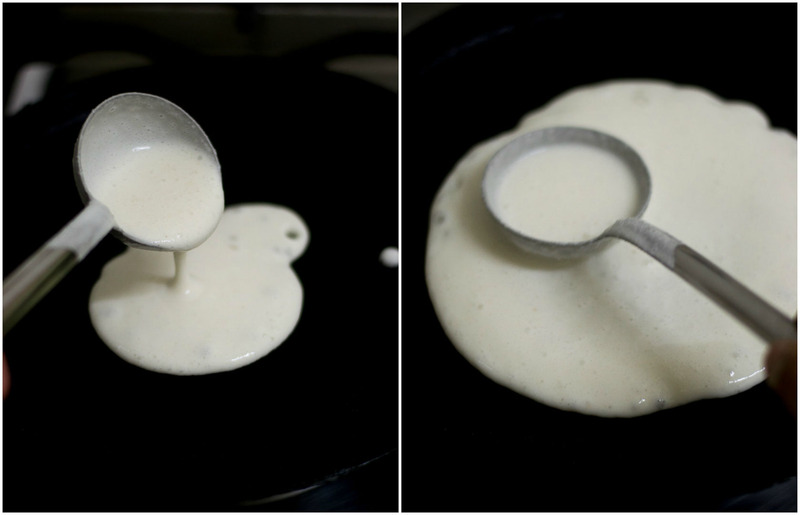 Add ⅓ cup batter and swirl to cover dosa griddle. Let the dosa be a little thick. Sprinkle ½ teaspoon of melted butter or ghee to the dosa. Cook until underside of the dosa is golden brown, about a minute. 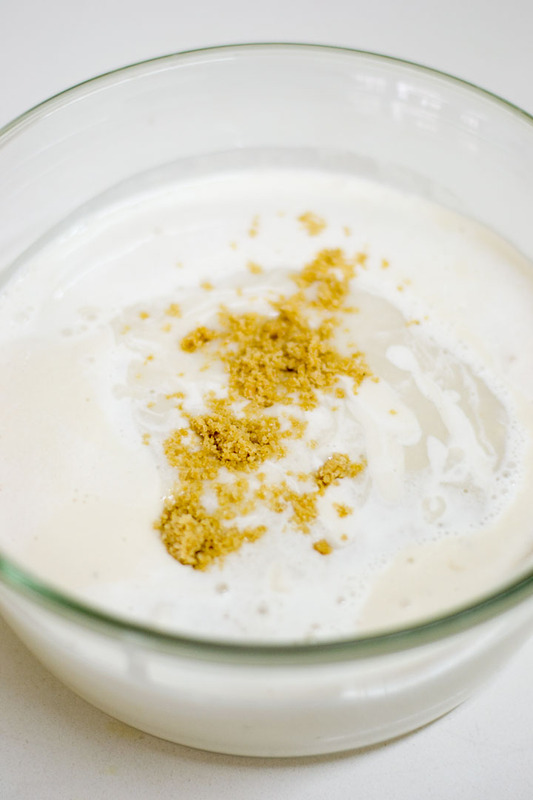 A tablespoon of sugar can be added to the batter for better color and browning of the dosa. This recipe was excellent. My husband likes his dosas crisp while my daughter likes it soft. I was able to do both with this batter. I used idli rice instead of parboiled rice and added a tsp of sugar after fermentation to get a nice Golden color. I made the dosas on the cast iron lodge pan too, I think this kind of a pan/griddle is essential to a good color and texture of the dosa. Thank you so much for sharing! I am 53 years old man from india ( Bangalore) basically born and brought up in north karnataka. I am now living in Zambia (Central Africa) as i am working here, since i live alone cooking is one my passtime and i love cooking and keep trying new recipes. Your website is very informative ,educative and very well compiled. Thanks a lot for sharing this recipe. I have one question which I tried to understand since a very long time but really could not find a satisfactory answer for this and i believe you can help. 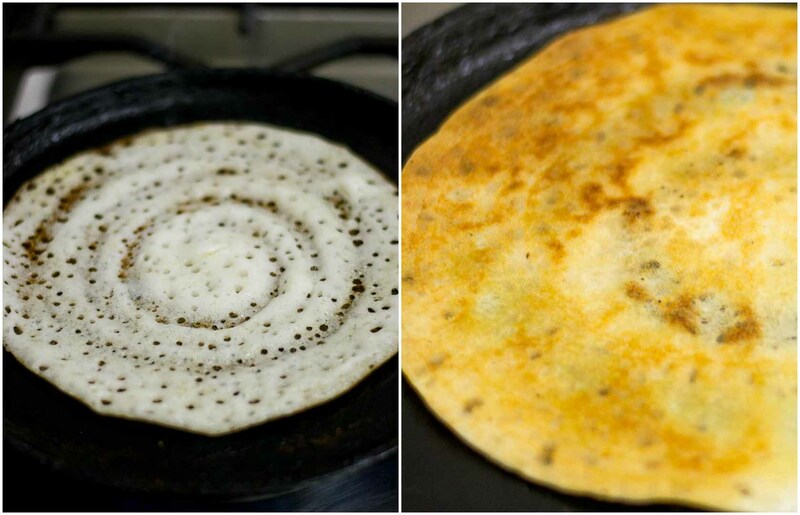 The dosas in few udipi hotels in Bangalore / Hyderabad are really dark brown in color [dark brown]. We have tried avalakki, urad daal in several ratios but it always ends up in light golden color. We are finally thinking that may be tawa is the reason. 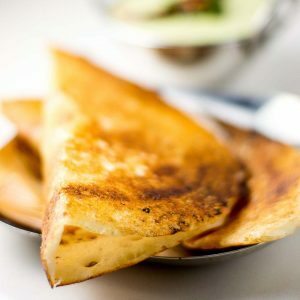 Can you please help us crack how to get such a uniform dark brown dosas. This will be applicable to dosa batter also. In addition to the above, I believe in Karnataka, they also add a few teaspoons of sugar to the batter while fermenting so it gives a nice caramalized color. Planning to do it today Sugu. Can v add fenugreek seeds in this? Can v grind dal and rice together? There is no methi seeds in the recipe. You may add if you like. I always grind the dal and rice separately so the dal doesnt get heated up while grinding.